Whilst there is cause for ‘congratulations’ that council is now responding to resident requests regarding the zoning of various areas within Glen Eira, we also find that the actions proposed fall far short of what is required. 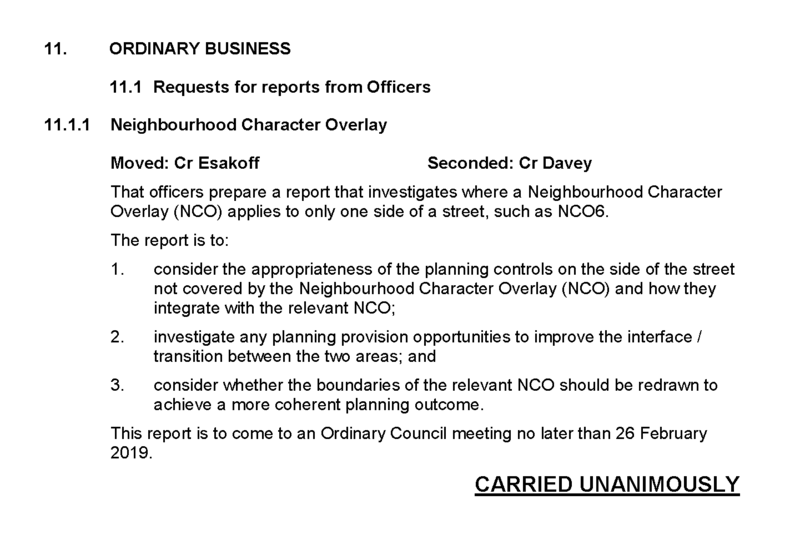 Instead of a total review of all NCO’s, the report only wishes to look at those areas on opposite sides of the street. It is also possible to see this as an explicit admission of how woeful Glen Eira’s planning has been. If planning was done properly to begin with we would now not be in the situation where it takes a huge resident outcry to get some responses underway. The incompetence of council’s planning is fully illustrated in the following screen dumps. Please note that these Neighbourhood Character Overlays also incorporate areas zoned as GRZ and RGZ. If the objective is to protect streets via the NCO, then it is really incomprehensible how these places could have been assigned the GRZ and RGZ zoning – which still stand. Thus, the issue isn’t simply about NCOs on the opposite side of the street, but the overall zoning embedded within existing NCOs – plus how many more streets and properties deserve to be granted an NCO. Thus we now have had 5 years of zoning and any amendment will likely take another 18 to 24 months – making this a 7 year issue where nothing has been done to correct previous glaring errors! Window dressing. What does “coherent planning outcome” mean anyway and why didn’t it happen donkeys years ago? Talk of transition areas has been an ongoing saga with no decent resolution. Council’s structure plans admitted that the 2013 introduction of the zones were to put it politely “unsatisfactory’ so they gave the green light for individual zones to go to street borders rather than have 3 zones within the one street as was the previous case. None of this addressed what the maps included here show, hence the problem remains. What should have happened is a total review of the zones and drastic changes made to them. All council has done is to sign off on protecting some heritage streets and increasing the spread of the grz to compensate. I won’t touch the issue about height in these areas or how much longer it will take for the neighbourhood centres to get some real planning done. The request for a report won’t solve anything unless you change the zoning and that’s pie in the sky for this council. I certainly agree with Jeff, can’t help wonder just what a “coherent planning outcome” looks like. The alleged strategic plan failed to deliver on the objectives of planning in Victoria, just as all the changes to the planning scheme without public consultation have similarly failed. Overlays are a second-order planning control. If Council is so concerned about different planning outcomes on two sides of the same street due to an overlay then if they were consistent they’d be worried about different zones staring at each other. But consistency isn’t their strength. On the points you raise about “different zones staring at each other” there are many many examples of this everywhere. Worse is different zones on back yards instead of covering the entire block of the street.